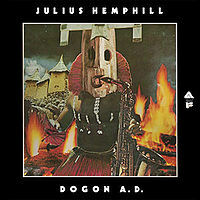 After years of obscurity, after foiled attempts by Tim Berne to get the rights… Julius Hemphill’s 1972 album, Dogon A.D., is again legitimately available. It’s been released by a Chicago label called International Phonograph, in a gatefold sleeve that replicates the LP’s cover (and apparently also includes the artwork from the original LP). I know many of you — OK, many of us — have managed to get copies of this music despite its being out of print. But I’d still implore you to get a CD copy, preferably from one of the outlets like DMG or Dusty Grooves rather than some uncaring online behemoth. Consider it an investment, a vote that says it’s worthwhile to keep good music alive. Don’t let the American Idol watchers win!